We are specialized in providing a wide range of Square Bowl. This product is available from us at market leading price. 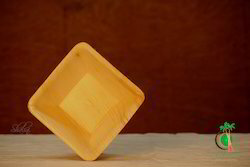 Our elegantly designed Square Bowl are offered by us to its customers at most affordable prices throughout the globe. Available in variety of shapes, colors, sizes, designs and customized options to meet the diverse expectations of the customers, these smartly designed Square Bowl, sourced from reliable sources. Red & White Colored bowl in aluminum. We offer a stunning range of hammered dinnerware which are unique shapes & styles. The whole collection of dinnerware looks amazing & can speak volumes about the dining area of a fine dining restaurant. The Plates are available in Full Plate & Quarter Plate sizes with matching square bowls. Our Acrylic Bowl is clearly as practical as it is beautiful. Its generous size, color and durability are suited for both indoor and outdoor entertaining, and its eye-catching contemporary design makes an instant impression. 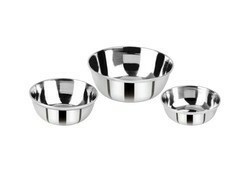 Fill it with vegetable , chips, snacks or salad - with this attractive bowl on your table, you won't need a centerpiece. Offering a wide range of Naturally Bio Degradable Leaf Square Bowl are made from naturally fallen leaves of Palm Tree (Areca) Earth Friendly / Renewable / Sustainable / 100% Natural. We are engaged in providing our clients a wide assortment of designer Square Bowl with Plastic Lid that is ideal for decorating the room. These are exclusively designed to add grace and elegance to the decor of the surrounding. These are recognized and appreciated by our customers for its intricate pattern and excellent finish.